Plot: On the evening before D-Day a paratrooper unit drops into Nazi occupied France. Their mission? Destroy a German radio tower at an old church. But when the unit, led by Corporal Lewis Ford (Wyatt Russell) infiltrates the town where the church is located, they discover a harrowing secret. Using the special properties of the region’s tar, Nazi scientists have been experimenting on the local citizens to create indestructible soliders…and terrifying monsters. Review: From a high level perspective, the horror and war genres appear distinct. War, by its very nature, is already a horrifying prospect and to some, adding a horror element seems problematic and unnecessary. For every Jacob’s Ladder or Dog Soldiers there’s Frankenstein’s Army or The Devil’s Rock. 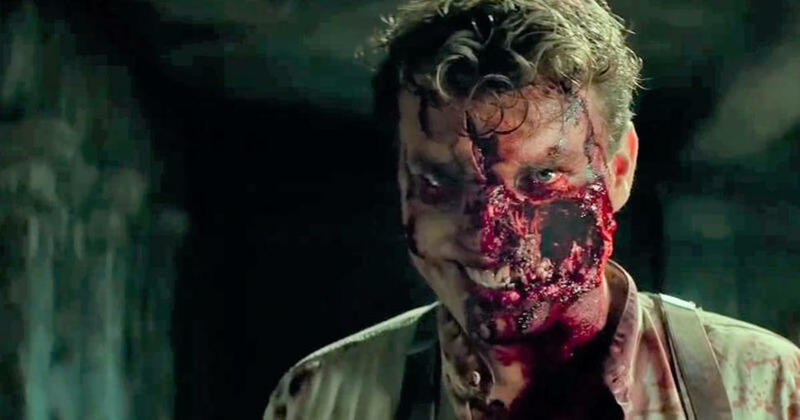 With Overlord, director David Julius Avery delivers something truly unique: a serious WWII body horror film that works. Dark, visceral, and highly entertaining, Overlord features adrenaline inducing war scenes, brutal horror, and some surprisingly poignant dramatic moments. Part Saving Private Ryan, part Re-Animator, and with just a sprinkle of the classic videogame Castle Wolfenstein, Overlord feels grounded despite its fantastical premise. 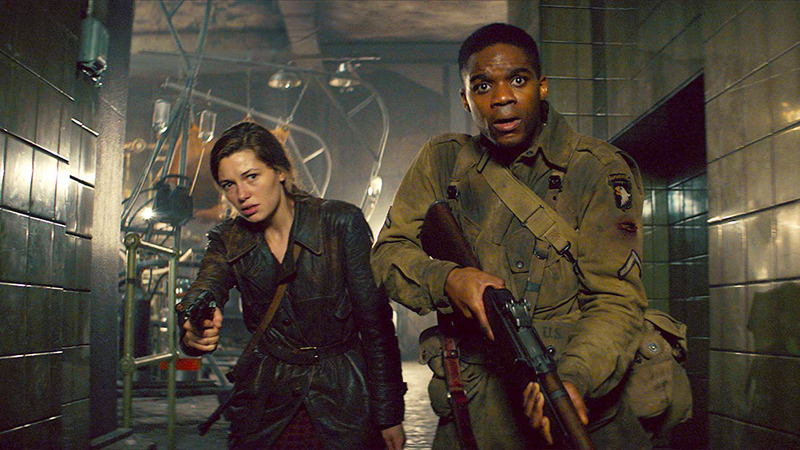 At the outset, Overlord feels like your traditional WWII film. All the classic elements are there: a late night drop into enemy territory, a plan that quickly gets shot to Hell due to circumstances beyond our characters’ control, and a local French civilian Chloe (Mathilde Ollivier) who aids our heroes. 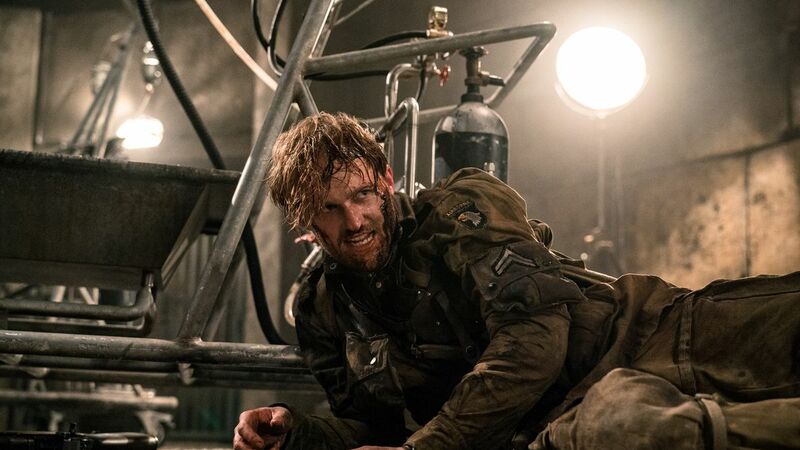 Even the heroes seem stock such as the peaceful Private Boyce (Jovan Adepo), the wise cracking sniper Tibbet (John Magaro), and the war weathered veteran Corporal Ford (Wyatt Russell). Yet none of these elements ever comes off cliché. The paratroop drop into Nazi occupied France looks and feels like something from a $100 million movie. Chloe’s subplot involving her little brother and the local Nazi captain demands your empathy. The representation of our heroes never feels trite. Rather each possesses intrinsic value that endears the audience to them. Billy Ray and Mark L. Smith deliver an excellent script with fully fleshed out characters and real stakes. 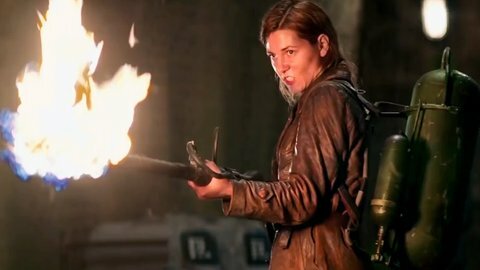 What’s amazing to me is how Avery weaves the horror element into Overlord. The military infiltration of the church compound possesses just as much realism as a horrific scene where a Private is brought back from the dead. It’s the antithesis of From Dusk Till Dawn. Whereas the vampire aspect of From Dusk Till Dawn feels stilted and forced, the body horror aspect of Overlord comes off natural and almost logical. Nazi scientists were heavy into eugenics so the idea of creating gruesome, death resistant super soldiers doesn’t seem far-fetched. Moreover, almost everyone in Overlord plays it serious and straight with the exception of Magaro who delivers the comic relief, what little there is. Considering the material, Avery could have easily chosen a wink-at-the-audience approach. However, keeping the serious undertone carries its own inherent risk, a risk that thankfully pays off. Overlord simply doesn’t lend itself to a jokey, comedic bent. That Avery is able to pull this off speaks volumes to his talent as a director. Cinematographers Laurie Rose and Fabian Wagner realize Avery’s vision throughout Overlord. Reminiscent of Janusz Kaminski’s work in Saving Private Ryan and Dean Cundey’s work in The Thing, the duo deftly balances large-scale military scenes with personal intimate horror. Despite the seemingly disparate material, the shots flow together perfectly whether it’s a harrowing parachute drop from Boyce’s perspective, a sniper shoot-out, or a final confrontation that possesses the DNA of Roland Emmerich’s Universal Soldier. It’s a visual feast and no shot ever feels wasted. To be sure Overlord is ostensibly Boyce’s story. We see him evolve from a somewhat naive pacifist, to someone who realizes that occasionally extreme action needs to be taken to do what is right. Adepo is excellent in the role and with Denzel Washington’s Fences also underneath his belt the future looks bright. However, Wyatt Russell OWNS this movie as Corporal Lewis Ford. Much like his famous father Kurt, Wyatt Russell commands the screen. There’s a menace, determination, and a degree of charisma that oozes off the screen. His scenes with Nazi baddie Captain Wafner (Game of Thrones’ Pilous Asbaek) are a sight to behold. Yet much like Boyce, Ford experiences his own journey that leads to a heartbreaking but satisfying conclusion. Ironically this is a role Kurt Russell would have played thirty years ago. Wyatt is certainly his father’s son and a talent to be reckoned with. I sincerely hope we get more features because I am fully aboard the Wyatt Russell train. Overlord is quite simply a gem of a film that didn’t get nearly the recognition it deserved when it was released last year. However, despite its limited release, this feels like a movie that will gain a cult following as years go by. I can’t recommend this flick enough. It’s a blast.